A free video cutter software to cut video files into small pieces. Free Video Cutter works on Windows XP, Windows Vista, Windows 7 and Windows 10, both 32-bit and 64-bit versions. Free to use - 100% free to download, install and use, no watermark, no extra fee. Free Video Cutter - Cut large video file into small clips. Cut unwanted parts - Cut unwanted parts like advertisements, outtakes and trailers. Convert video formats - Convert video formats after cutting video. Vast video formats supports - 3gp, asf, avi, flv, mp4, mpg, rm, rmvb, vob, wmv and more. Cut audio from video - Rip and cut the audio data from your video file. To cut a video, select it by clicking Add Video File. Now, choose the part of video you want to cut by using the trim sliders right next to the play, pause and stop buttons. You need to select both the start frame and the end frame of the video section you want to extract. The application contains a Segments database in the mid-right section and you can add as many video segments as you want. This options helps you select various parts of a single video in their respective segments, which saves you quite a lot of time. As I mentioned earlier, there are numerous video and audio formats to choose from to set as output file. The available file formats can be selected by using the drop down menu under Video Formats. Additionally, you can set other video output options like codec, size (resolution), bitrate, framerate, along with audio options such as bitrate, sample rate, number of audio channels. In case you want to change some user-preferences, head over to Options under Edit menu. 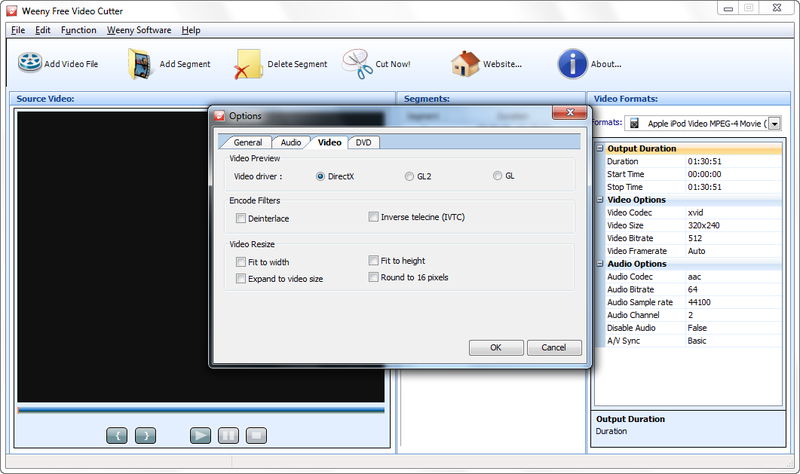 The configuration window contains General, Audio, Video and DVD settings. The General tab contains options like selecting Output Folder of your video files, Process priority and Number of threads to use in case you're using a multi-core processor. Audio Tab lets you select output audio volume as well as other format parameters that I mentioned earlier. Under the Video tab, you can alter a few options like Video Preview (DirectX, GL2, GL), Encoding Filters (Deinterlace and Inverse telecine (IVTC)) and Video Resize (Fit to width, Fit to height, Expand to video size, Round to 16 pixels). There is nothing much to explore under the DVD tab. After choosing your desired settings, click OK.
Once you have carefully mapped out the video part you want to trim, just click Cut Now! button at the top to start the cutting process. A small progress window will pop up, showing you a summary of output settings and the remaining time before the process gets completed. Here, you can choose to stop the process as well as mark Shut down computer when encoding finished. The application is available for free, and works on Windows XP, Windows Vista, Windows 7 and Windows 10, on both 32-bit and 64-bit OS. Weeny Free Video Cutter is an application designed to help you trim video files, as well as convert them to other file types, such as MP4, MPG, AVI, WMV, MP3 and OGG. The interface of the program is clean and pretty intuitive. You can import a video clip by using the file browser only, since the "drag and drop" method is unsupported. Batch processing is permitted, meaning that you can cut multiple pieces from the same video at once. In the list you can check out the segment number and duration. So, you can preview the clip and trim it by marking the start and end position. Once you specify the output destination and file type, you can proceed with the encoding job. But you can also modify audio and video parameters when it comes to the codec, size, bit rate, frame rate, sample frequency rate, channel mode and synchronization. Optionally, you can disable audio and enable Weeny Free Video Cutter to automatically turn off the computer once the task has been completed. The video processing tool takes up a moderate amount of system resources, has a good response time, quickly finishes a task and manages to deliver a good image and sound quality after conversion. We haven't come across any issues during our testing and Weeny Free Video Cutter did not freeze or crash. There's also a brief help file with snapshots that you can look into. On the other hand, you do not have the possibility of selecting additional splitting methods (e.g. by specifying the start and end time values, into equal-sized parts). But, even so, we strongly recommend Weeny Free Video Cutter to all users. When working with video editing software, there are many programs available on the market that will perform the tasks that you require. Seemingly advantageous, this can actually create a problem when you are trying to find just right software that will perfectly fit your style. As most of the programs come with too many options and settings that require some time to adjust to, inexperienced users will have a hard time when they need to quickly complete their tasks. All these trouble are now gone, as Weeny Free Video Cutter is the simple solution that everyone can enjoy. This easy to use tool provides an intuitive interface, appropriate for all types of users, even those that just want to do only simple editing. Why bother with complicated settings when all you want to do is to cut a single segment from your favorite video. The handy tool provides the means to work with a vast range of video formats like: 3gp, asf, avi, flv, mp4, mpg, rm, rmvb, vob, wmv and more. Furthermore, this powerful program can save the segment you selected in any format that best suits your interests as: 3gp, avi, flv, mp4, mpg and wmv. With this user friendly software, editing is a breeze. Weeny Free Video Cutter comes with an easy to use interface especially designed to help you work as fast and efficiently as possible. All you have to do is to select the video that you want and play it until you reach the desired time interval. When you found the time frame that you are interested in, you simply select the "Start to trim" option. With "stop to trim" you can easily select the end of your segment and there you have it: a well delimited fragment. With the help of the "Add Segment" feature you can effectively select multiple parts from the same video. Another perk is the fact that you can easily delete any no longer required fragment from the selected list. If you want to edit longer clips then you will really enjoy the program's capability to fast-scroll your video to the place from where you want to start editing. After defining the desired segment of the video, all you have left to do is to choose one of the video format that the program offers. This efficient application will automatically do all the conversion and segmenting, so, after pressing "Cut Now", you can just relax. In just three easy steps, Weeny Free Video Cutter will instantly get the job done. Cons: I found no difficulties in the use of this tool. Summary: In all a useful and good tool for video. 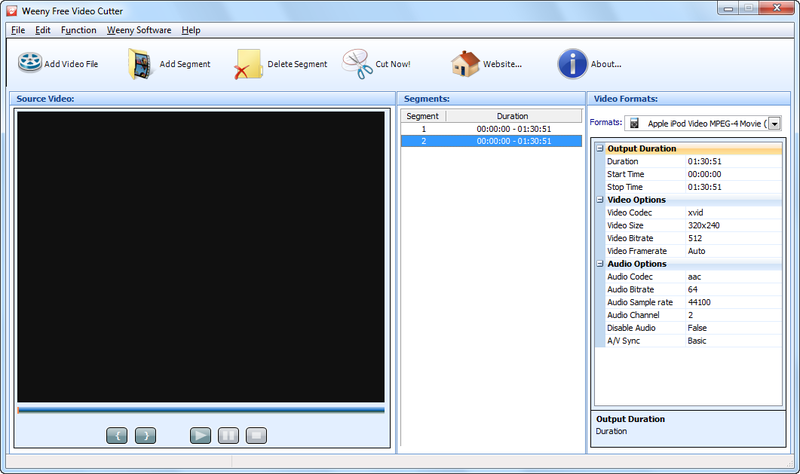 This 20M program (Weeny Free Video Cutter) includes video codec in its directory. I installed it on my all new laptop and have no problems with converting or cutting video. Some small size video cutting software may require installing additional codec pack and avisynth.